Fran Stancavage is a managing researcher at the John C. Flanagan Research Center at AIR in San Mateo, California, where her career spans 35 years of work in education and health. Most recently her interests have centered on validity issues in educational assessment, the implementation of large scale randomized field experiments, and program evaluation. Since 1995, Stancavage has directed the National Assessment of Educational Progress (NAEP) Validity Studies project, which assists the National Center for Education Statistics in maintaining high standards of validity for the NAEP assessment. The project has published numerous research studies and white papers and maintains an expert panel that meets three times a year. 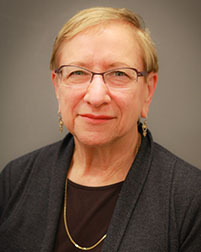 During this time, Stancavage has been co-principal investigator on two major NVS studies: a 2007 validity study of the NAEP mathematics assessment at grades 4 and 8 and a 2009 study of the Sensitivity of NAEP to the Effects of Reform-Based Teaching and Learning in Middle School Mathematics. Stancavage has also contributed to a number of other NVS studies and white papers. Stancavage also currently serves as director of implementation for a five-year, eight-district impact study for the Institute of Education Sciences that is investigating how a comprehensive teacher and leader evaluation system influences teacher instructional practice, principal leadership, and student achievement. In addition, she is principal investigator for the independent evaluation of The College Board’s i3-grant funded effort to develop, pilot, and evaluate new technology-enabled student- and classroom-level feedback reports for AP biology.